Work has started on Onward Homes’ £3.6 million affordable housing scheme on Colebrooke Road in Aigburth, Liverpool. The scheme is to be called Clifton Gardens in memory of Louise Clifton from Allerton in south Liverpool, a sales manager at Onward Homes, who sadly died at the age of 32 in 2015. 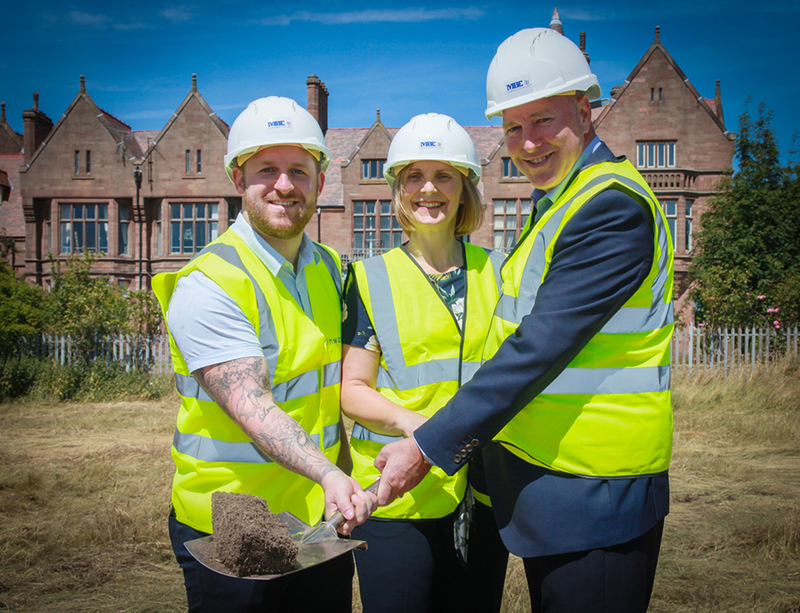 Her brother, Shaun Clifton, was invited to cut the first sod of turf to officially mark this important milestone, along with Lin Powell, Head of Development at Onward Homes and John Morris, chief executive of MBE Construction. The development of 24 new homes sits at the southern end of the grounds of The Turner Home, a historic house which ash operated continuously as a home for retired gentlemen since 1885. Designed in partnership with The Turner Home, developer Onward Homes is offering four properties for affordable rent and 20 homes through their shared ownership scheme. The scheme includes four 1 bedroom apartments and twenty 3 bedroom terraced houses. A managed wildlife garden will be created next to the site, enhancing the public open space both for the local community and wildlife. This scheme was supported by a Homes England grant of £488,000. The development is due to be completed in June 2019. Designed by architects Halsall Lloyd Partnerships (HLP) who are located in Liverpool and the main contractor is Birkenhead – based MBE Construction. For more information on Onward visit onward.co.uk, email sales@onward.co.uk or call 0151 708 2421.